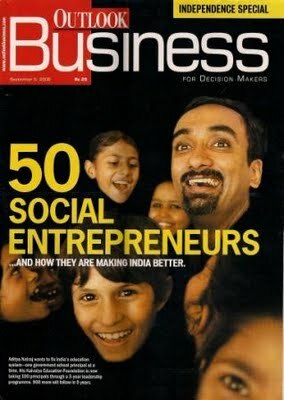 Outlook Business (5 Sept 2009) has come out with an independence special edition on '50 Social entrepreneurs ' and 'how they are making India better'. The Blue Yonder is humbled to be amongst the 50 new wealth creators. Quoting Outlook Business, "Social entrepreneurs: The new wealth creators:They put society above self. They use entrepreneurial means to drive social change. These 50 entrepreneurs are enriching the nation. They're in different fields, doing different things. But each of these entrepreneurs has made a huge social impact with his or her enterprise"
What is even more exciting for us is to know that some of our friends and partners with whom, we have worked and interacted personally in the last few years in Community development, Disaster Management and Responsible Tourism are also among the 50 social entrepreneurs! They are Prema Gopalan -Sakhi/SSP, Ishita Khanna from Muse / Ecosphere, Vijay Aditya - Ekgaon, Ashok Khosla - Development Alternatives, Ela Bhatt - Sewa, Bunker Roy - Barefoot College, Gijs Spoor - Zameen Organic and Anshu Gupta - Goonj. To read fellow entrepreneurs check this link on Outlook Business. To read about the entry on The Blue Yonder follow this link. To follow some other recognitions and awards we have won in the last 4 years, please check this link. "Congrats to the Blue Yonder team! :-)"
"Excellent job buddy! Keep it up." Great Gopi.Congrats to TBY and others featured. Gopi great news.. congratulations.. Do u I see in Mumbai??? Congratulations on inclusion as a significant force for social change in India. Well deserved Blue Yonder! "Congrats Gopi. Well deserved recognition..
Great to hear about this. Recognition from topical media is a sure sign that TBY has arrived (coz it always takes a lot of time/luck otherwise) The first time we met, I could see your inner drive for TBY project. Good luck Gopi, and the rest of the team. I have been a keen observor of TBY for last 3 years since I met Gopi in Oslo. Not many people continue to pursue the passion for so long and inspire literally many others in different parts of the world to do good for the country they come from. Mr. Sinoj`s observation is on target as its true about how difficult its to be noticed by local media in any country. Keep on doing the good work.